Step one: Control existing weeds. If your garden has any weeds, you first need to take care of them prior to doing anything (except planning). You have a couple of options. You may rototill your garden to dig under existing weeds or you can spray out the garden with a non-selective herbicide such as glyphosate (Round-up). You should do this well before you plan to plant. This will only control the weeds that are there now and you will have more weeds germinate as the temperatures begin to warm up and water is applied. You may have to either manually take out any newly germinated weeds or spray just prior to planting. Take care not to bring weed seeds up from lower soil layers by tilling too deeply. such as such as black plastic, white plastic (which is best for cool season crops planted in late summer). Brown Infrared Transmitting (IRT) plastic (great for heat to move into the soil better than black plastic but still blocks weeds), Red plastic (seems to increase yields in some crops) and Silver plastic (best as a deterrent to aphids). You can also use compostable materials such as straw, and other coarsely ground organic materials or cardboard, old carpet or thick layes of newspaper. 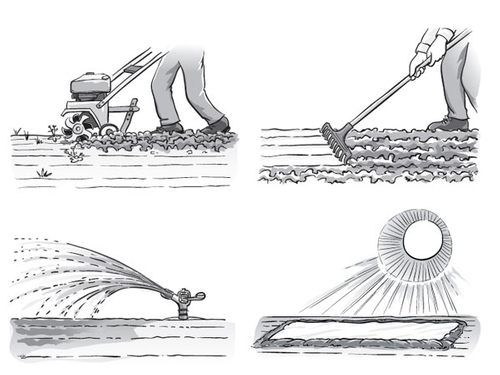 The organic materials should be applied deeply enough to truly block weed growth-about 4-6 inches deep. I went from wood raised beds to a beautiful raised brick bed problem is i cant control the weeds. I used to keep some year round fruits and veggies in it but that made it difficult to use weed killer, plastic cover etc. So I removed them. 10 years of this huge brick bed. Last year I used black plastic end of summer thru spring and so far the ground looks clear but I know they will be back as soon as I plant and water. The buttercups are the worse you never get all the roots. Im about ready to go back to raise wood gardens. So frustrated. I suspect your weed problems are not directly related to the brick vs wood planters - that's probably coincidental timing more than anything. 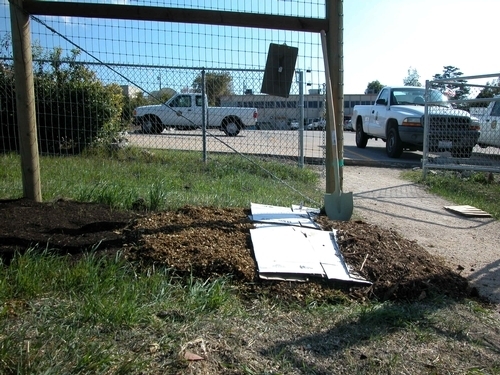 If you are using the black plastic in an effort to heat the soil (eg solarization) you might want to read the UCIPM publication "Soil Solarization for Garden and Landscape (http://ipm.ucanr.edu/PMG/PESTNOTES/pn74145.html) - there is good information there about clear plastic vs black plastic as well as ways to maximize performance. There is also a UCIPM publication focused on Creeping Woodsorrel and Bermuda Buttercup that may help with your problem too (http://ipm.ucanr.edu/PMG/PESTNOTES/pn7444.html.